Thresholds provide more than just a visual barrier between two different floor surfaces. They help keep the seal firm and prevent carpet from buckling. A tight seal between floor coverings also keeps moist air from seeping upward from below, slowing the process of decay from mold and mildew. 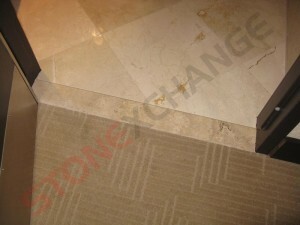 Marble thresholds are among the most commonly used in the industry. This natural stone is not only elegant and complements other stone surfaces in the room, it also enhances the quality and value of the property. Here are five reasons for using marble stone as the material for a flooring threshold. Because it is a natural stone product, marble is nearly impervious when it comes to moisture. When set upon a suitable substrate, marble becomes an impenetrable barrier and creates an almost perfect seal. -Better than a wood product-. Wood is relatively inexpensive and can be shaped nicely into any and all of the popular threshold styles. However, wood is extremely porous even if properly treated. Over time, wood thresholds tend to trap moisture because of colder air contacting the material from below. Moisture from the interior room is also a problem because of the moderate humidity. Eventually, wood thresholds must be replaced. This operation costs as much as the original installation procedure. It also means that carpet may have to be stretched all over again, the substrate material may have to be altered for the new threshold to fit properly, and the new threshold may have to be varnished or stained in order to match the shade of the previously installed wood. Marble thresholds are cut to exact shape and size by expert machinists. They will fit perfectly when placed on a level substrate material. They last longer than most of the other materials used in construction and will not allow any moisture to penetrate through the seal between floor coverings. Natural stone has been prized as a building material for more than 2,000 years. Long ago, architects and building experts realized the lasting value of marble because of its ability to hold its color shade even after years of exposure to sunlight, moisture, and contaminant particles. -A solid, weather-resistant stone product-. Marble is very dense and is a combination of several simple compounds. The rock is formed when pressure results in a metamorphosis of the compounds. High heat is also involved, and the process of igneous stone formation produces an extremely fade-resistant material. Marble needs very little polishing in order for its appearance to be bright and shiny. This polishing or honing process is carried out at the manufacturing site when the stone is cut into threshold material. The familiar streaks, spot patterns, or veins seen in natural marble stone will retain their color for hundreds of years. Because marble is non-porous, the outside elements have little effect on the luster, brilliance, and shine of the material. Thresholds are subjected to constant contact with people’s shoes, but marble is extremely resistant to wear and tear caused by scuffing. The brilliant color lasts and lasts, with little maintenance required over the years. Using natural stone is a wise investment. It is also the most affordable method of creating a sense of elegance and stature when used as a building material or for interior decorating. Stone has always been prized as a material for construction because of its lasting value, but it also transmits an air of sophistication and fine taste. -Creating a look of opulence-. Interior designers are always looking for an affordable way to make a living room, hallway, or bedroom stand out through the use of eye-catching materials. Marble thresholds and shower curbs give the bath a definitive look, one that actually energizes the visual sensations merely through the complementing of color shades. A beautiful threshold that complements the shade of the walls, fixtures, and moldings sends a strong, positive signal to the brain of the onlooker. Marble stone is available in a huge variety of color shades, each of which has its own variety of vein patterns. Depending on the style of furnishings, carpet, wall accents or lighting, a well-chosen threshold made of natural marble stone sets off and highlights the visual appeal in a customized manner. No two interiors will look exactly the same. This elegance is less expensive than most people realize. Due to the scope of the direct importing/distributing of marble tiles, slabs, and thresholds, beautiful stone for interior construction and decorating is one of the most affordable materials now available in today’s building industry. Quite simply, marble does not crack, break, or discolor. Over the years and decades, the original stone threshold maintains its luster and polish long after the floor surface needs to be replaced. -The best investment in the property-. Although the purchase of a small amount of marble threshold material may cost nearly twice as much as hardwood, it will last more than 10 times as long. The maintenance costs are virtually zero, and the value of the property is increased. A residential home that incorporates marble tiles, thresholds, and sills into the construction may cost about $5,000 more in terms of material and labor, but the overall value of the property may increase by more than twice this amount. As far as actual maintenance is concerned, very little attention need be paid to the threshold itself. The polishing or honing given the stone at the manufacturing center lasts for decades, and all that is needed to maintain the brilliant luster of marble is an occasional wiping with a cloth. Homes that contain marble as the primary floor, threshold, and window sill material are owned by people who spend very little on cleaning agents, soaps, waxes, and polishes. Pre-cut marble thresholds are manufactured form the highest quality stone that has been selected for its strength and continuity of patterning. The thresholds available at home improvement centers and flooring supply outlets are guaranteed against breakage, chipping, and discoloration. One of the most common problems with wood or composite thresholds is the eventual warping experienced by the homeowner or business property manager. Wood is especially susceptible to warping because of the changes in temperature and humidity as well as the inevitable shifting of the structure over time. -Marble thresholds maintain their shape-. Stone does not warp, expand and contract, or swell. This means that the product will provide a strong seal between carpet and tile, with no visible cracks developing over the years. Special threshold designs are available that take into consideration the safety of individuals. Many areas have building codes that specify a maximum height for a threshold, in compliance with the ADA. Marble thresholds are placed onto a substrate at or below the level of the floor surface, and they will never buckle upward to create a pedestrian hazard. This is another reason why replacement of thresholds made from marble is virtually unheard of. The hardness of the stone prevents any influence such as heat or humidity from altering the shape of the threshold, making it the perfect material for use as a flooring product. Direct importers and distributors order thousands of pieces and have them delivered to retailers, construction companies, and home improvement stores. These pre-cut marble thresholds are sized to match building instructions and are available in a wide variety of color shades. Delivering a high-quality product at an affordable price used to be quite a problem in the construction industry, but thanks to the association between importers and bulk buyers such as flooring installers, the per-piece cost is actually less than that of many hardwood products and simulated marble materials. Consumers are pleased with the retail prices seen at the larger flooring product stores because these merchants order their stock from an importer that has connections with quarrying operations and fabricators. This means that the middle-level wholesaler is eliminated from the equation, bringing the cost of the product down significantly. One of the best ways to entice real estate customers is to show them a beautiful interior that has been decorated with natural stone. At the same time, the customer is shown the price tag of the property. Customers scratch their heads and wonder how this is possible when the home or office looks as though it was designed for use by heads-of-state. The answer lies in the affordability of bulk-ordered natural stone. Marble thresholds are usually available in the same color shade and styling as the accompanying tiles, sills, and mosaics. Beautifying the interior of the home or business property has never been more affordable, and the savings can be passed along to the end-user. Sales go up, reviews are glowing, and everyone is happy because everyone wins. Consider natural marble stone as a material for floor thresholds or shower curbs. It is a wonderful investment in the property, and the property itself will be the talk of the town. Contact us today to speak with a professional.